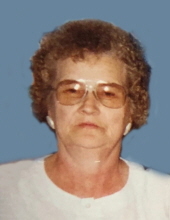 Age 91 of Owosso passed away Wednesday, March 20, 2019 at her home. Funeral Services will be held 11am Tuesday, March 26, 2019 at Nelson-House Funeral Home with Chaplin Donald Bennett officiating. Burial will follow at Hillcrest Memorial Gardens. The family will receive friends at the funeral home on Monday from 4pm to 8pm with the Ladies Auxiliary Ceremony at 6pm. Lucille was born March 2, 1928 in Clinton County, the daughter of Ed and Pauline (Martin) Bandt. Lucille was a life member of the Corunna VFW Auxiliary Post #4005. She married James Stanley Richardson on February 12, 1972 in Owosso; he predeceased her on August 8, 2006. Lucille worked as a nurse's aide at Ovid Convalescent Center and Revard's Nursing Home in St. Johns. Lucille is survived by her children Christine Malik, Edna Firovich and Patrick McAninch; grandchildren Jack (Cathy) Cords, James (Stacy) Cords, Joe Cords (George), Todd (Angela) Smalley, Lucie McAninch, Patrick McAninch Jr; 9 great-grandchildren; 2 great-great grandchildren; other loving family members and friends. She was predeceased by her husband, parents, grandson Jeff McAninch, 2 sisters and 5 brothers. Memorial contributions are suggested to the family or the American Diabetes Association. To send flowers or a remembrance gift to the family of Lucille Edna Richardson, please visit our Tribute Store. "Email Address" would like to share the life celebration of Lucille Edna Richardson. Click on the "link" to go to share a favorite memory or leave a condolence message for the family.